I’ll tell you a secret. Back in high school, when we had cooking class in school, I dreaded those times when I would actually be in charge of cooking. My favorite tasks were being the marketer (in charge of buying the ingredients) and being the dishwasher. Haha! I know a lot of people hate washing dishes. I don’t LOVE it but I love the water. So, for me, when I wash dishes it’s just like playing with water. These days though, I don’t like washing dishes so much because now I have to do it a lot! Plus, it can be such an ardous task if you don’t have the proper washing tools to use. There are definitely dishwashing soaps and scrubs that work better than others. Speaking of scrubs, I wanted to share with you my review of this dishwashing scrub that I’ve been using for a month now. It’s a brand called Scrub Daddy. It’s new here in the Philippines but it has been in the US for several years already and has actually been featured in the show Shark Tank in 2012. 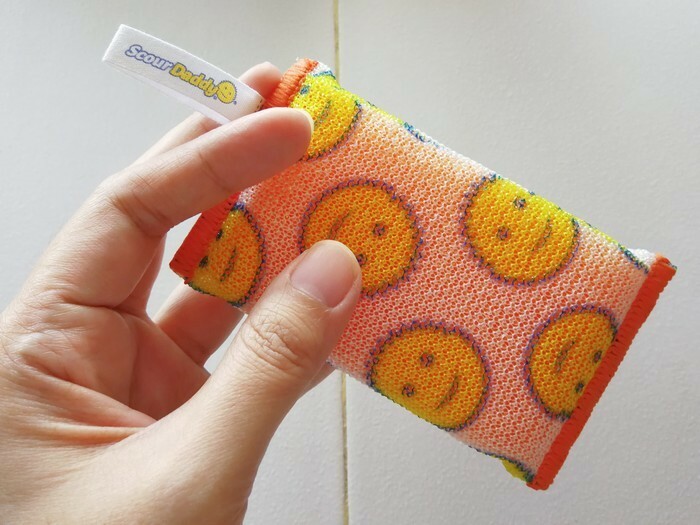 Scrub Daddy combines exclusive materials with fun, functional designs and makes them into high performance cleaning products, such as texture changing scrubbers, smell resistant, sponges, and scratch-free scour pads. It is due to this that the brand is known as America’s Favorite Sponge. For the past month, I was able to try one of their product lines called Scour Daddy. They claim it to be stronger, thicker and more absorbent than ordinary scouring pads. It has an Armor Tec mesh on the outside and under that you will find the FlexTexture foam that made Scrub Daddy America’s Favorite Sponge. You can use the Scour Daddy to clean just about anything in your household including furniture, cabinets, hardware, shelves, floors, windows, walls, and baseboards. In your kitchen, you can use it to clean non-stick pots and pans, ceramic and enamel stovetops, china, dishes, and utensils. For the bathroom, Scour Daddy can be used for the shower, sink, toilet, floors, cabinets, and fixtures. Lastly, you can use it outdoors for your lawn furniture, swingset, toys, bikes, fences, and deck railings. We received four packs of Scour Daddy. They came individually packed and in three different colors – blue, yellow, and pink. I decided to use one sponge for washing dishes, another for cleaning in the bathroom and another for cleaning the stove and kitchen tiles. What I love is that I can use a different color for each one. Color coding your cleaning makes it easier to avoid cross contamination, especially for the two that I use in the kitchen. The Scour Daddy comes in one size only. It measures about 4.5 x 2.5 inches and about 0.78 inches thick. The size is perfect for my hands. Bear in mind that I have long fingers. The scrub occupies about 70% of my hand. It wasn’t too wide nor too thick for me at all, making it super easy for me to grasp and maneuver around whatever it is I am washing. The lack in size options might be a negative for some people though. I know that my husband, for instance, prefers a thicker, squarish scrub. In the kitchen, we were able to use the Scour Daddy to wash stainless steel utensils and knives, plastic cups and containers, plates and serving platters in glass, ceramic and melamine, stainless steel pots and pans, as well as a non-stick stovetop grill. I personally love how smoothly the scrub glides along the surface especially on stainless steel. It also took little effort to clean plates and cookware that have hardened food particles on them. Usually I need to soak those in soapy water for a long time first. With the Scour Daddy though, I didn’t really need to do that except for one time when I cooked tocino and there was a lot of hardened food particles left on the pan. After some soaking though, the scrub was able to remove everything easily. I’m happy to say that the scrub also didn’t leave any scratch marks on the surfaces, even on the non-stick grill. We usually only use foam sponges on those to prevent scratch marks. But the Scour Daddy is truly non-abrasive so you don’t need to worry about scratches. I also love that Scour Daddy doesn’t stain easily. I noticed that with some of the other scrubs I’ve used in the past, food tends to leave a stain on the scrub, making it look dirty. Sometimes food also get stuck on some scrubs but with Scour Daddy, food actually rinses off of it easily too. So far, our Scour Daddy scrub still looks like almost brand new despite being used daily for the past month. As for cleaning the bathroom with it, I also have no complaints. Our bathroom tiles or sink do not really require too much hard scrubbing anyway because there aren’t normally hard stains on them. Anothing thing I like about it is that you can dry and store it easily using its removable hang tag. 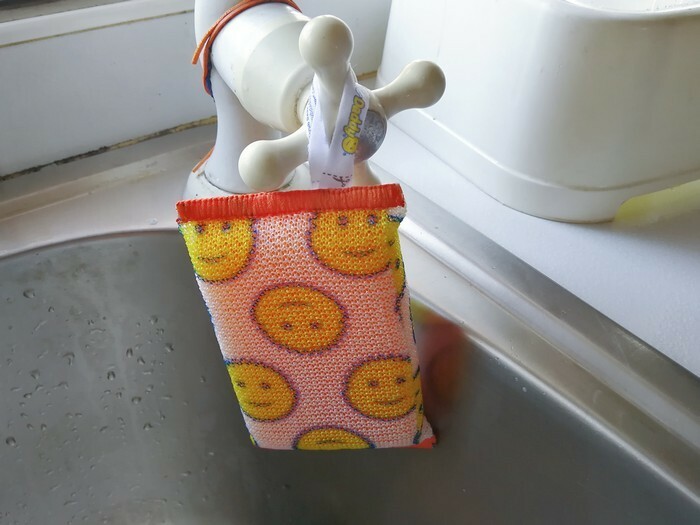 You can use a hook to hang it or do what I do, which is just to hang it on the faucet so that any remaining water can fall directly on the sink. 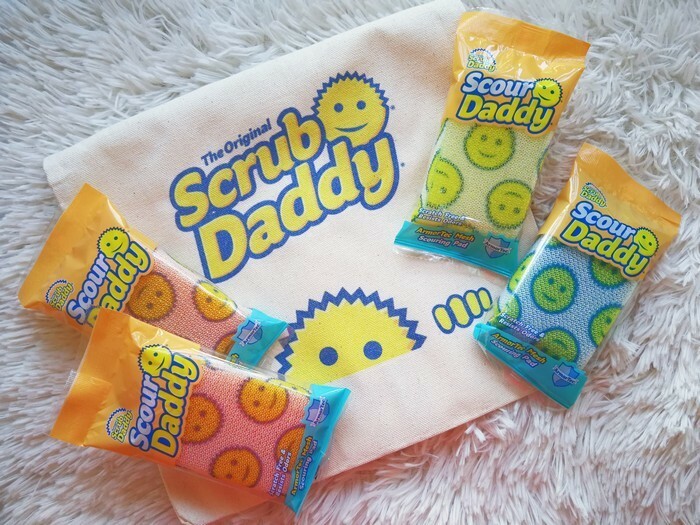 For those who are thinking of using Scour Daddy to clean their car, I heard you can do so as well. We just haven’t tried it because my hubby usually sends our car to the car wash for cleaning. Overall, we had a really satisfying experience using Scour Daddy. So, yes, I do think you can just about clean anything with a smile when you use it. If you’re interested to purchase one, Scour Daddy is only available via Shopee at the moment. It sells for only Php 70 per piece. 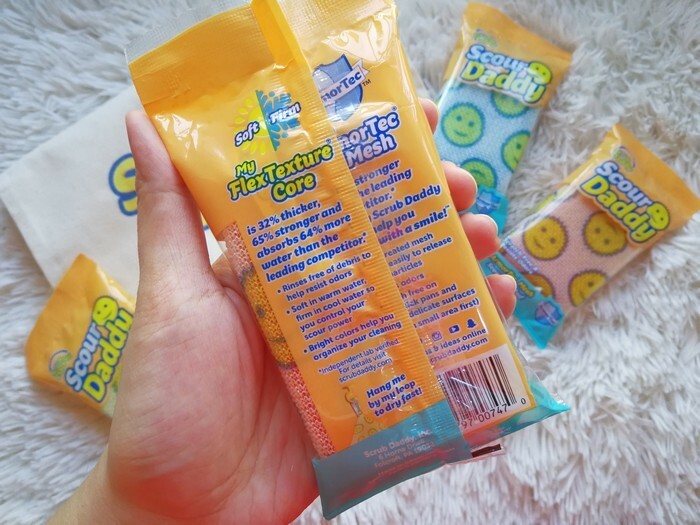 You can also follow Scrub Daddy Philippines on Instagram for more updates. Now, on the most exciting part. 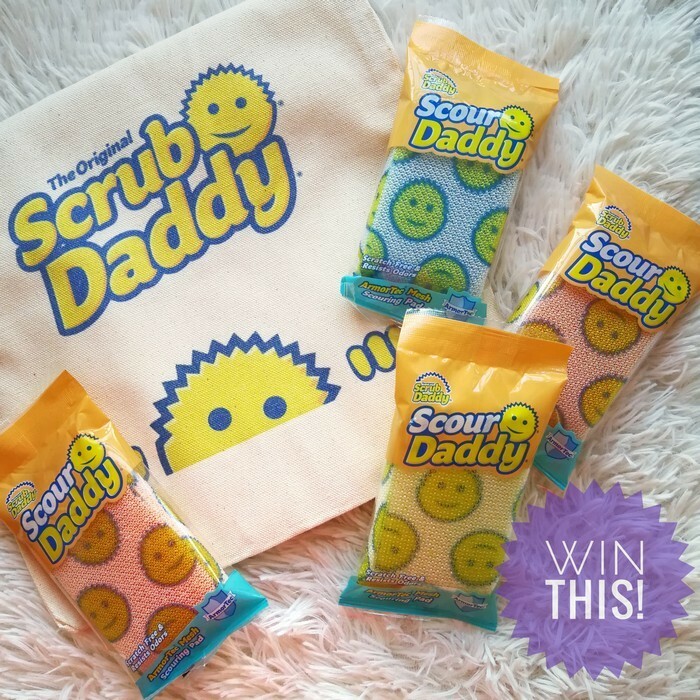 Our generous friends at Scrub Daddy is sponsoring a Scour Daddy gift pack similar to the one given to me (see photo below) to ONE lucky winner. 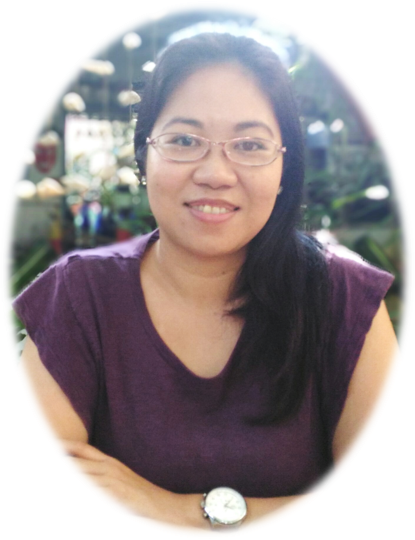 To join, participants must be Philippine residents with a valid Philippine mailing address. 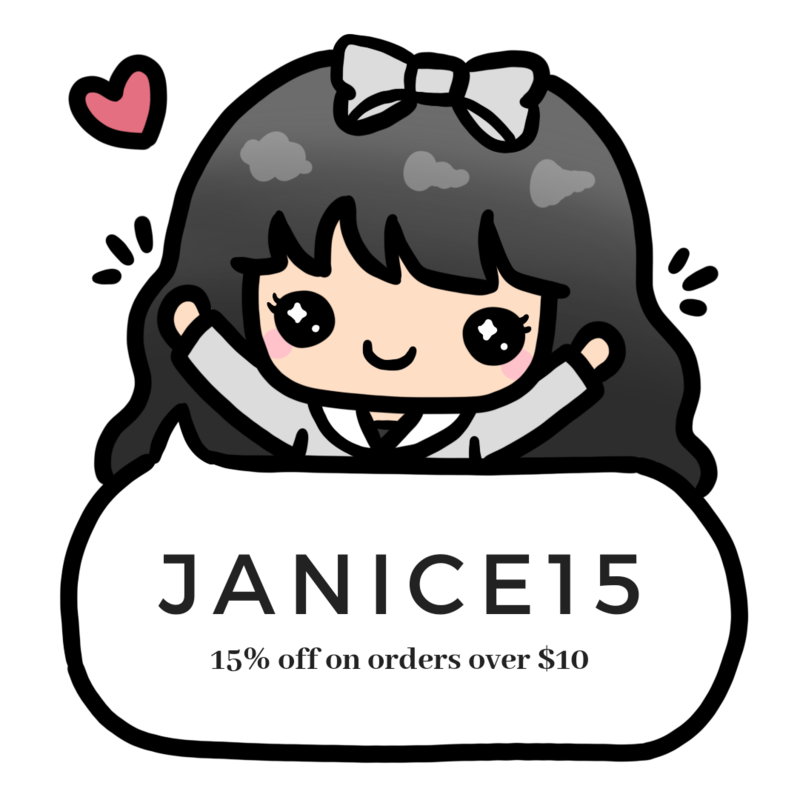 Participant must fill up the Rafflecopter form below in order to join. 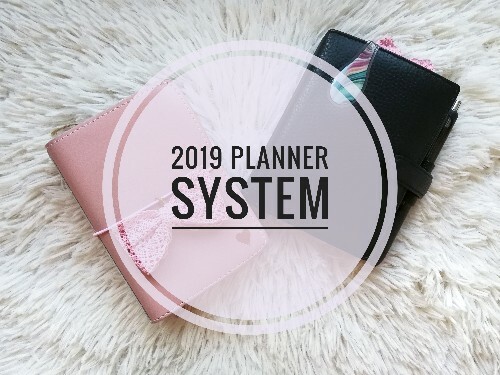 This giveaway will run from March 28 – April 3, 2019. 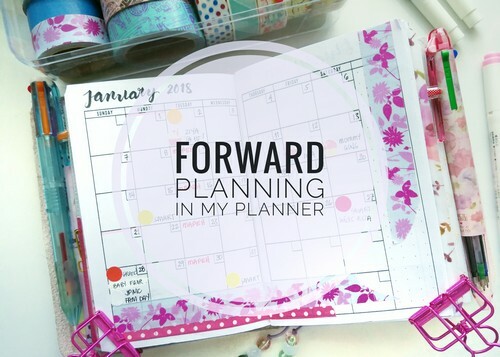 The winner will be drawn randomly via Rafflecopter and will be announced via the Mommy Plannerista Facebook Page. I will inform the winner regarding his or her win through email using the email address he or she stated on Rafflecopter. The winner must then reply to me with his or her complete mailing address and contact number, which I will relay to Scrub Daddy. Mailing off the prize will be the responsibility of Scrub Daddy. Para po sa akin, ang ayaw ko po talaga sa mga gawaing bahay ay yung paghuhugas ng plato at kaldero lalo na kung may mga nakadikit at mahirap tanggalin.. Nakaka stress mommy.. Sakit na sa kamay sa pagkuskos hindi mo pa matanggal tanggal ang dumi..
Buti nalang po at na introduce mo itong Scrub daddy momsh.. Ngayon ko lang po ito narinig,. Malaking tulong po ito para hindi na ako mahirapan pa sa mga gawaing bahay.. At ang cute pa kasi may ibat ibang kulay pa na para palatandaan na ito para sa plato, pang linis ng shelves at pang kubita.. Ang galing.. Gusto ko po ito matry mommy..
Can’t wait to try Scrub Daddy ! 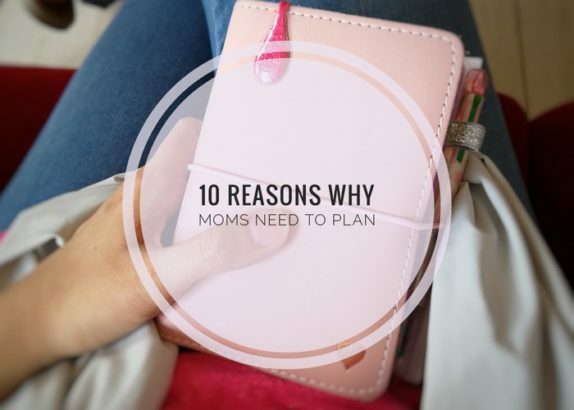 It’s a Mom’s “things on my list” priority for the house. I can’t wait to try Scrub Daddy. It’s something that’s for sure in every mommys wish list.